Minced meat recipes tend to be hearty, homey and hard not to love! From traditional lasagna to hot and spicy chilli con carne with kidney beans, a rich sauce and crunchy tortilla chips. There are minced recipes from countries around the world for you to dig into. It’s a very versatile ingredient that can be skilfully cooked with a slice of butter and a combination of herbs to create exciting new dishes. Healthy meat recipes made with minced are high in iron, protein and flavour! Minced meat recipes go back centuries worldwide, to when healthy meat recipes comprised of simple chopped or ground meat served with crusty bread or made into a hearty stew. Did you know that bolognaise, the most well-known and loved minced meat recipe, wasn’t actually invented in Bologna, Italy? In the late 18th century, in a small town outside of Bologna, ragu was served. This simple meaty tomato sauce served with pasta is thought to be the dish that eventually transformed into the bolognaise we enjoy today. In rural parts of Italy and traditional restaurants away from the tourist locations, you’ll still find ragu served rather than bolognaise on the menu. A slice of butter and glug of olive in the pan will give your minced meat recipes an extra dose of flavour. The earlier you season and flavour your minced meat, the tastier your dish will be by the end. So, as soon as your minced is in the pan browning over with the butter and olive oil, add your salt, pepper and any other flavourings your meat recipes require! For high protein recipes, you’ll probably be cooking tasty lean minced or lean beef cuts. These low-fat meats are very healthy for your body but often stick to the pan. Try using a low-fat butter like Lurpak Lighter with Olive Oil to help your lean meat cook without sticking to the pan, and without increasing your fat intake. Craving comfort food? When you’re out of macaroni but still salivating at the thought of a tantalising pasta dish, this is the recipe for you. It’s one of our favourite comforting minced recipes that can be made with ingredients you’ll likely already have in the fridge. If you love spaghetti bolognaise you’ll adore this pappardelle al ragu recipe! 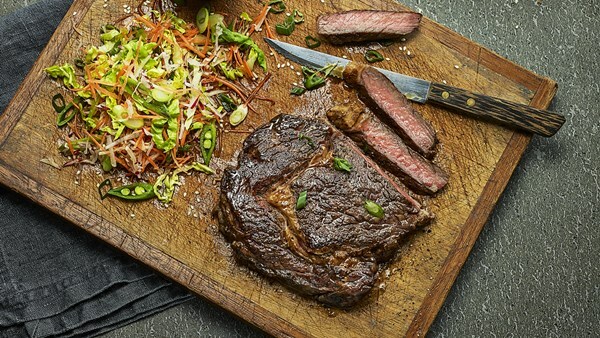 Healthy meat recipes, like our rib eye steak with Asian coleslaw recipe, don’t need to be dry. In fact, you’ll find our method for cooking steak locks in an abundance of flavour from the creamy Asian inspired sauce with mustard, soy sauce and rice vinegar. We like our steaks medium rare! Finally, here’s our simplest recipe ever with just 5 ingredients! Kell Scott’s Danish roast pork is so simple to follow, but you’re bound to end up with perfectly crispy crackling every time. The key ingredient to a great crackling is great butter.